SU History Conference 2017. Coming Soon. Be excited. Our understanding of material culture continues to evolve and the meaning attached to the various ‘things’ people possessed has certainly changed over time. Objects – from quotidian to ephemeral, visual to scribal, and sartorial to ornamental – have increasingly entered into scholarship as evidence of historical processes and mentalité. While consumerism has long been associated with advanced capitalism, people, materials, and even ideas have been exchanged since the earliest societies. Commercial networks continue to evolve, as evidenced by recent discussions on trade – from the Brexit movement to tariffs. Material culture and consumerism, then, have a long history that is intertwined with human exchange. 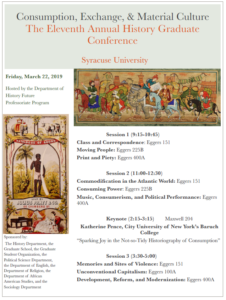 For its Eleventh Annual Graduate Conference, Syracuse University’s Future Professoriate Program is seeking papers related to material history and consumption. Topics can include: the exchange of goods and services and the meanings attached to those exchanges; histories and theories of goods and services; the exchange of ideas and information (including news and rumors); praise for and critiques of consumerism; the connections between globalism and consumption societies; slavery and the movement of people for profit; blackmarkets and trade in illicit goods; and all other themes related to material culture, trade, and consumption. The Future Professoriate Program’s annual conference offers graduate students of all levels an opportunity to present their research and to receive feedback from professors and peers alike. This year’s keynote address will be presented by Katherine Pence, Director of Women’s Studies and Associate Professor of History of City University of New York’s Baruch College. Dr. Pence has also co-edited Socialist Modern: East German Everyday Culture and Politics. The day’s schedule will also include a light breakfast, lunch, and closing reception with refreshments. Please submit proposals to suhistoryfpp@gmail.com by the extended deadline of January 31, 2019, and include a brief abstract (300-word maximum) and a current CV. Applicants will be notified of their acceptance by early February. We invite proposals from across the humanities and the social sciences on the variety of topics related to commodities and their consumption. In addition, we accept proposals for both individual papers and complete panels. For panel applications, please also include a 200-word panel abstract, in addition to the individual paper abstracts. 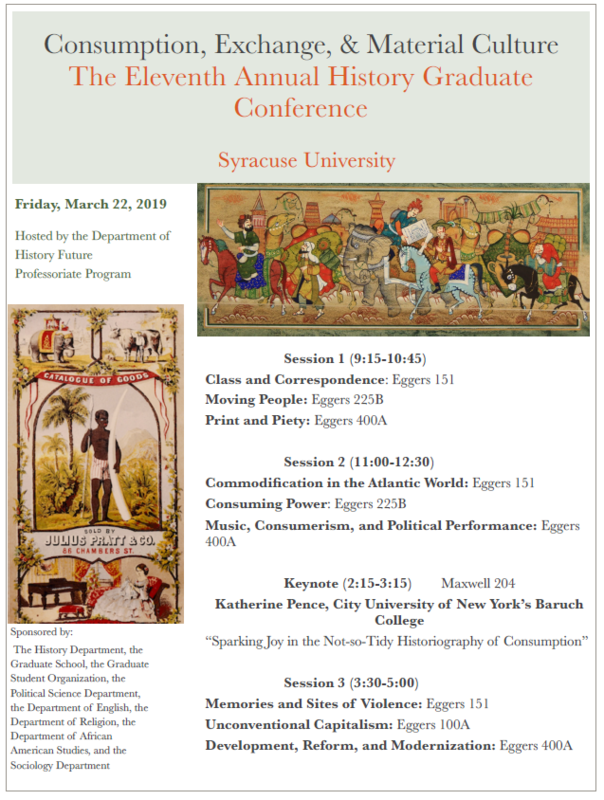 The Future Professoriate Program of the Department of History at Syracuse University will host its tenth annual graduate conference on Friday, March 23rd, 2018. As debates rage in our country over the proper interpretation of Confederate symbols, we are reminded that collective memory never applies to an entire body politic but instead fractures along fault lines political, social, ethnic, racial, gendered, and religious. To celebrate the ten-year anniversary of the history graduate conference, our theme this year will be memory. Papers that focus on memory repression, subversion, or omission are encouraged, though we invite proposals from any and all studies that treat the subject of memory. Suggested topics include, but are not limited to: amnesia, collective memory, “coming to terms with the past”, commemoration, divided memory, forgetting, local memory, the manipulation of memory, memorialization, places of memory, the politics of memory, public/official memory, and remembrance (including remembering violence, war, and genocide). The Future Professoriate Program’s annual conference offers graduate students of all levels an opportunity to present their research and to receive feedback from professors and peers alike. Furthermore, we are pleased to announce that Andrew Lipman, assistant professor of history at Barnard College and recipient of the 2016 Bancroft Prize in American History for his book, The Saltwater Frontier: Indians and the Contest for the American Coast, will give this year’s keynote address. The day’s schedule will also include a light breakfast, lunch, and closing reception with refreshments. Please submit proposals to suhistoryfpp@gmail.com by February 1st, 2018. Proposals should include a brief abstract (300-word maximum) and a current CV. Applicants will be notified of their acceptance by early February. Given the span of memory studies, we invite proposals from across the humanities and the social sciences. In addition, we accept proposals for both individual papers and complete panels consisting of two to four presenters. For panel applications, please also include a 200-word panel abstract.